Cheese on toast is about as far as it goes when it comes to cooking with cheese in my house. Montgomery's on sourdough (if I've got it) with Tommy K or Worcestershire Sauce and lots of black pepper is pretty much the perfect lunch in my opinion. So I was intrigued when Hove-based cheesemonger La Cave a Fromage announced they were teaming up with a chef called Chris Bailey to put on a 'taste of cheese' meal with every course featuring cheese in some way. Bailey has recently moved to Brighton and is currently gauging the lie of the land before hopefully opening his own restaurant. 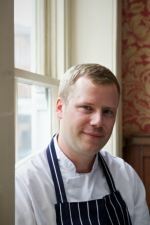 It's an exciting prospect because he has a pretty decent CV that includes The Bentley, Chez Bruce and more recently The Black Rat in Winchester, where he won and retained a Michelin star. The menu at La Cave featured a succession of fun dishes with cheffy twists, such as a playful take on a Ploughman's complete with a Brillat Savarin toastie and pickled onions, a Bleu de Basque risotto and 16-hour slow-cooked Angus beef cheek with a Beaufort rarebit and tangy blonde beer ‘air’. But the star of the show was a pretty dish of mozzarella 'snow' and smoked anchovy, which came with an arty arrangement of baby carrots, radicchio and celery shoots laced with a sweet ice wine vinegar. The 'snow' was essentially just frozen cheese, shaved into into icy particles. It sounds a bit gimmicky and Italian mozzarella purists might disapprove, but I liked the sensation of the icy flakes melting in my mouth before the milky flavour of the cheese came through. It was like a savoury cheese sorbet and it looked amazing against the dark slate. Blitz the mozzarella and and water to a smooth puree in a liquidiser. Season with lemon juice and season well (frozen food needs more seasoning). Freeze in a plastic tub till solid. Shave as you would a granita with a fork and store in the freezer till needed (use that day). Use the best mozzarella you can for flavour. If using cheaper mozzarella which is usually drier, add a little more liquid to compensate.